Play your favorite tunes on the go in clear, full audio. Our built in high capacity rechargeable battery lets you be on the go with up to 6 hours of playtime (At 50% volume). The Speaker is designed to be the perfect companion on the road. Its exterior helps protects the speakers from any scratches or impact. Its resiliency enables even a car to go over it without any damage in sight. Included 3.5 mm auxiliary input helps your device to connect effortlessly. Pair this speaker with virtually any Bluetooth-enabled device with ease.In addition, it's the best gift idea for your loved ones, due to its wireless Bluetooth connectivity and exclusive design! Sensitive touch button. Easily switch between your 4 options of how to play your SoundBox (Bluetooth, Micro SD, Aux-In,USB). Control your music with our elegant controls. The simple touch system allows you to Play, Pause, or Skip your music at your leisure as well as answering phone calls. 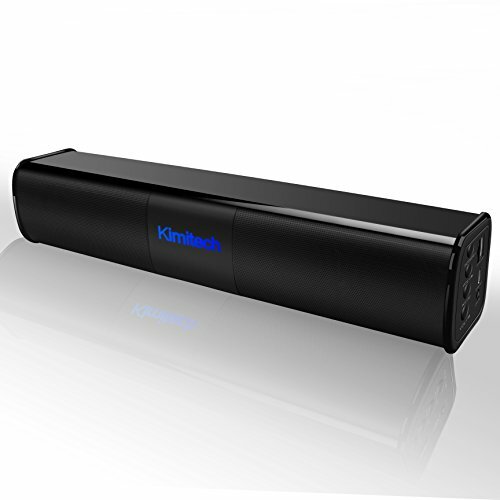 Wireless portable bluetooth speaker - Enjoy a High Definition stereo sound with a impressive volume whether you're lounging around the house,or partying,walking out,camping,hiking,biking with included drawstring travel pouch. Superior sound quality - Enjoy your music in 12W full-bodied stereo realized through dual high-performance drivers and an unique enhanced bass. Long playtime - Built-in Li-Ion 1800 mAh rechargeable battery guarantees up to 6 hours playtime in 75% volume. Recharge in just 2-3 hours with included micro USB cable. Multiple LED Settings - Built to fit your mood, and get you in the party zone. If you have any questions about this product by Kimitech, contact us by completing and submitting the form below. If you are looking for a specif part number, please include it with your message.